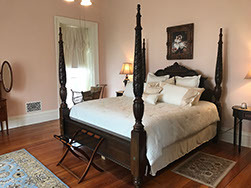 Built in 1859 as the original Limrick Mansion, Linwood Lawn has been restored to create a Bed and Breakfast experience you will never forget. Prepare yourself for a mansion experience unlike any place you have ever stayed. 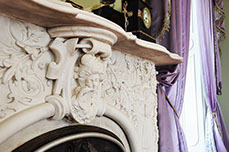 Enjoy the sunset on the west porch on a summer evening, study the original imported Italian fireplace mantles, or relax with a book in the ladies parlor. 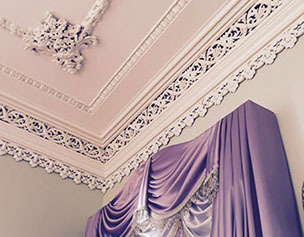 The entire first floor is yours to explore and admire, from the beautiful Grand Ballroom to the ornate dining room, you will see what makes a stay at Linwood Lawn an unforgettable Bed and Breakfast experience. Each of the spacious bedrooms features 14 foot high ceilings, beautiful countryside views, King size beds with luxurious linens and bedding and private bath. The rate charged for the two North bedrooms (John’s room and Nina’s room) is slightly lower simply because the bathrooms and showers within aren’t quite as large, but the rooms themselves are equally as accommodating and the amenities provided in each bedroom are the same. 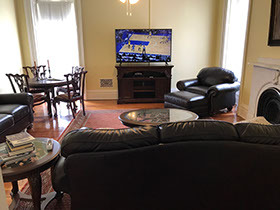 Convenient to each of the bedrooms and centrally located on the second floor is Ella’s equestrian themed common area which features a large screen TV with access to DIRECTV channels and comfortable leather coaches. The master bedroom features a beautiful canopy bed and eastern window views of the countryside. The bedroom windows slide up in the casement allowing six-foot step through access to the second story porch. John’s Room features one of the earliest examples of an oriel window on the west. 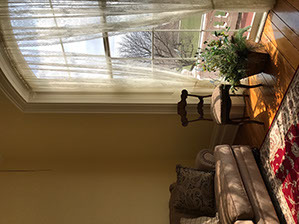 A window that is located on a second story and is freestanding is typically referred to as an oriel. The oriel in John’s room is a charming and unusual element for a house built in this era. The Limrick’s youngest child, daughter Nina was born in this house in November, 1861. 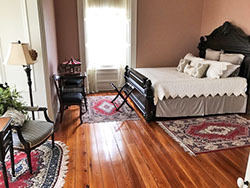 The Northeast bedroom was subdivided and used as a nursery, evidence of which is still visible by looking closely at the floors to see the lighter wood color where the nursery walls once stood. Nina’s room features outstanding views of the northern horizon. 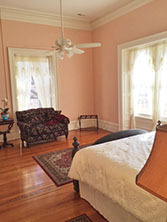 Anne’s Room is highlighted by a magnificent southern bird’s eye view of the countryside, lovely setting area and beautifully appointed accommodations. Anne was fifteen years old when the family moved into their new home. 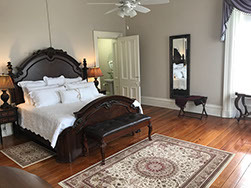 Not long after she left to attend a Monrovian College in Salem, N.C.
May’s Room is available in combination with rental of any of the other bedrooms (with shared bathroom) for $100 plus tax per night, for up to two additional guests. May spent part of her adult life in Cuba where she operated a mission with her husband. Check out on Day of Departure: 11 a.m.
Linwood Lawn is a non-smoking establishment. If we discover that you have smoked in your room or anywhere within the premises a minimum fee of $250 will be charged for professional cleaning services. If any damage if discovered, you will be charged the full costs incurred to restore the property damage. Pets – Due to the historical nature of the property, we regret that we cannot allow pets. Children- Also due to the nature of the premises and safety concerns we do not allow children under the age of 16 to stay overnight at Linwood Lawn. 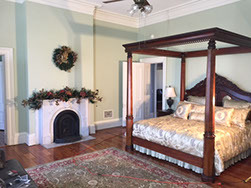 Extra guests – Each room has a maximum occupancy of two guests. There are no exceptions to this policy.